The Brown Bear Lane mural is painted on the side wall of a shop along George Street, at The Rocks. It depicts Brown Bear Lane in 1901, which was located close to this spot. The Rocks' very first pub, The Romping Horse, was located on the corner of the lane from 1789, later known as The Brown Bear (1836–1900). The lane became Little Essex Street but disappeared around 1913 when a row of shops was built between Essex Street and this location. 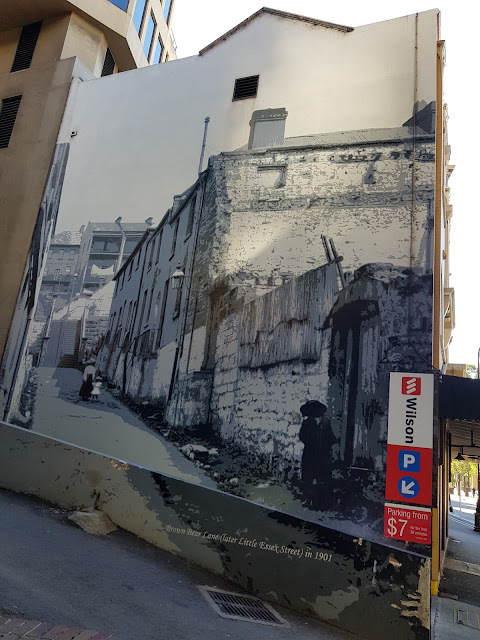 The row was partly demolished in 1956 when the railway viaduct was built, connecting to nearby Circular Quay railway station. Great painting! It looks like the back lane of some parts of our town. I like it, looks like another street to walk down. It looks very realistic Jim. I saw this mural when I was in Sydney in February this year. ...a nice walk back in time. Always nice to see that old pictures of history. I like that. Very unique mural and great shot! nicely done. looks like an old postcard. Nicely done! Have a grand weekend!